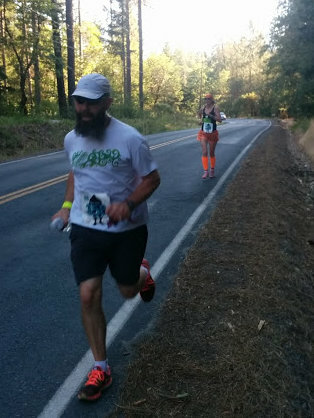 Earlier this summer I got the chance to run the Wild Rogue Relay race in southern Oregon. At the time, I took notes so I could write a post about it, but it’s been a busy few months. I left the Discovery Center where I’d worked for over eight years and started doing consulting work which messed with my schedule. As a result, posts other than the Boise Brew Minute have been few and far between. I have a lot to catch up on so here’s my overview of the Wild Rogue Relay. A friend in our local running club had lived in southern Oregon before moving to Boise and heard they had a new relay race. She wanted to try it. This was a little longer than the Ragnar relay I’d done before but a lot had changed since Ragnar (she wanted a team of 12, I’ve now run ultras). I agreed that if she could get a team together, I’d run it. Besides, my mom’s family was from that part of Oregon and it would be fun to spend time there. In fact, the course followed the Rogue River from its headwaters to the Pacific and that was one of my grandfather’s favorite rivers to fly-fish. When race day arrived, our twelve person team had shrunk to a 10 person team meaning we had six extra legs to run. We divided into two vans with five runners each and headed out. While van 1 went to the start at Applegate Lake, those of us in van 2 slept in, then had a leisurely breakfast before heading out to meet van 1 at the exchange after they completed the first six legs. They did great. Getting to the exchange about 10 minutes before we expected them. They had all run great first legs and one lucky guy had run two. Now it was our turn. For the next seven hours, we took turns running. The valley heat was getting intense in the mid afternoon. The course followed the river and went past bucolic meadows and picturesque wineries. As tempting as it was, we decided not to sample the wine at this point in the race. When it was my turn to run, I headed out in 95°F (35C) heat, feeling good. Unfortunately, heat always gets to me and by the middle of my 8 mile stretch, my stomach was not happy with me. I slowed a little and got passed by a runner who seemed to be barely sweating at all. When I finished my leg, my teammates had snacks ready for me, but I was still in no condition to eat. Fortunately, my legs were still feeling pretty good. Much better than after the first leg of Ragnar. Running shorter distances was one advantage of having a larger team, the other was that when we passed the baton (actually it was a slap bracelet but baton sounds cooler) back to van 1, we got to stop long enough to sleep. Note the cannon. How cool is that? The race organizers had worked with a local school to allow us to sleep on their field and the booster club would sell food just like at home football games. Glendale High School has an amazing entrance. 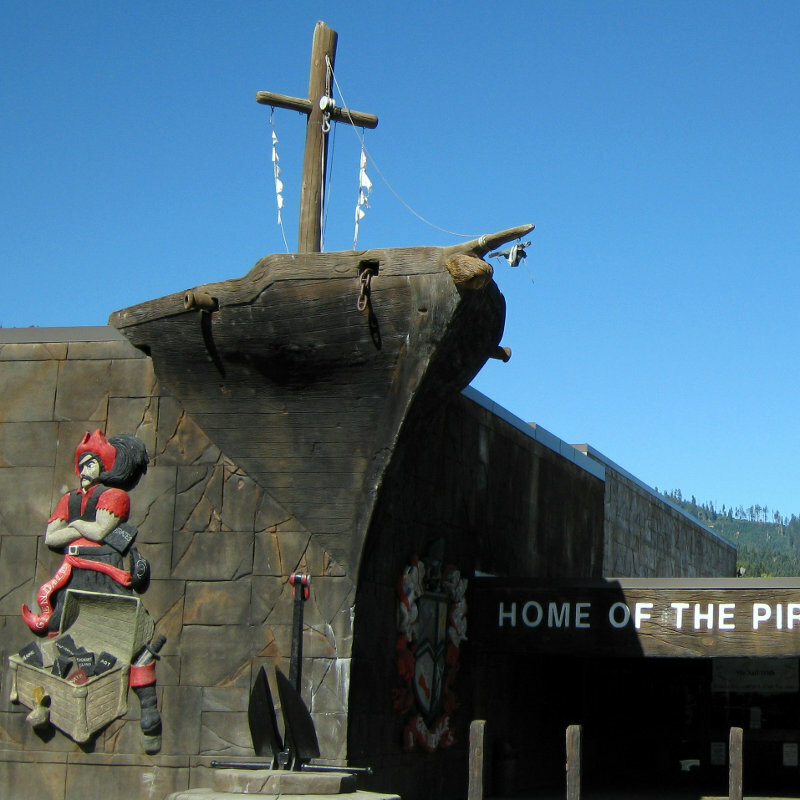 It looks just like a pirate ship. By now, I was feeling good enough to eat a little food then try to get some sleep. The best part of sleeping here is that we wouldn’t have to guess what time to get up to be at the next exchange. They had people on the course who would radio to people at the high school when our runner was 45 minutes from the exchange. They would wake us up and we’d arrive just in time. What could be better? It turns out that many Oregon towns we established around the logging industry and some still have mills operating 24 hours a day. It turns out Glendale is one of those towns. We could hear logs going into the mill all night along with the beep of backup alerts on the machines. Combined with the six or seven shotgun blasts that went off, it was tough to fall asleep, but we all managed. When we woke up, there was only one other team still on the grass. What had happened? We were in the first third of teams to arrive. How had we fallen so far behind? Someone must have gotten hurt. As we discussed the possibilities, we rushed to pack up and one of the organizers came over to talk to us. The good news was our team was all fine. The bad news was that the watcher hadn’t noticed when our runner went by (apparently there was a big panic about another team going off course) and our team had been waiting for us at the exchange for 20 minutes. We packed quickly and raced to meet up with them. We managed to make the 45 minute drive in around 26 minutes, slowed down only when our route finally met with the race course about a mile before the exchange. By now we were all wide awake and ready to run. My second leg started around 4:00am. It was a cool run on a narrow road through the woods. My legs were feeling great and my stomach was no longer giving me problems. Most of the run, I was on my own and occasionally turned my headlamp off. The rhythm of my footfalls and the sounds of the forest at night were hypnotic. The miles drifted away. With about a mile left, I heard the first set of footsteps coming up behind me. I had run seven miles at an average pace of one minute per mile faster than my first leg without getting passed and now someone wanted to pass me? I assumed I’d pay for it later, but was feeling so good, I decided to increase the pace. Make them work to pass me. I took another 30 seconds per mile off my pace and kept expecting them to catch me at any point. When I saw that I had only a quarter of a mile to go, I noticed footsteps had faded and their headlamp no longer lit the trees ahead of me. At the exchange I wondered how I would recover in time for my final leg, but that was a problem to be solved later. It was around 7:00 when we met van 1 for the next major exchange. We were all excited about this one because Dutch Brothers (a race sponsor) was going to be there with free coffee and the race organizers had our pre-ordered breakfast burritos. The sun was rising. It was going to be a great day to run. Unfortunately, by the time we arrived, Dutch Bros was out of coffee and the race organizers were confused about our order. While sorting that out, I went to use the Port-a-Potties and found they were full. Right up to within an inch of the seat. Pretty gross. On a positive note, I was no longer interested in whether they had our breakfast burritos. As the day continued, we spent more time talking with the other teams, encouraging their runners and finding out about their team names (like Awesome Sauce, Rogue Beavers, S.O.R.E. and Orange is the new Orange). It was fun to find out where everyone was from, how many relays they had done and what other races they were focusing on. We even met a woman who was moving to Boise in eight days and planning to join our running group. Sometimes the running world is so small. When it was our turn to run again, we were almost at the coast. It was sunny but much cooler than in the valley and the breeze was blowing in from the ocean; great running weather. 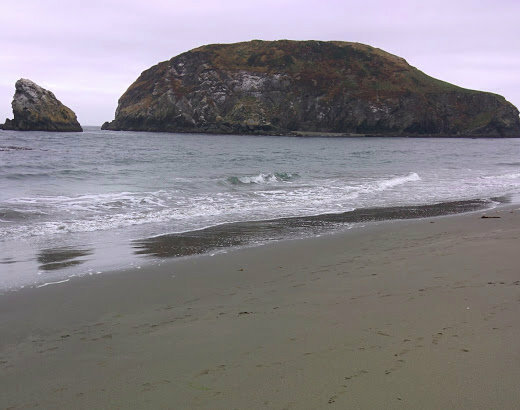 When we hit the coast, several runners had sections that went down and ran on the sand or followed trails away from the road. Since we couldn’t follow the runners, we talked with the other teams some more. One section had a long trail portion that looked pretty steep. When runners came off the trail, many said they had to walk parts of it because it was too steep and treacherous. One even said it was the hardest trail she’d run. When our runner finally made it out, we went to check on her. She blinked twice and said, “That was awesome! Can we come back tomorrow and run it again?” Some people! My last leg was 7 miles along 101. It is such a stunning section of road along the coast. This leg was very different from my last. First, as expected, my legs were a little sore and slow to get started, but they eventually warmed up. The solitude of my night run was replaced with cars flying past me every few seconds. Rather than the stillness of life inside the illuminated halo of my headlamp, the clear skies and bright sun meant there was always something to distract my attention. Very different but still a wonderful section to run and I managed to finish it only slightly slower than my second leg. The fact that my first section when my legs were fresh was a minute per mile slower than the other two is clearly a sign that I really don’t do well in heat. As we approached the finish line, we met up with van 1. We all wanted to be there together. It felt good to finish. Then it was time for the party and Standing Stone beer (another sponsor). Turns out, it was not our day to connect with sponsors. By the time we arrived, they were out of beer and there were many teams still finishing. Oh well, we’ll grab some food and go take a shower. Except they didn’t have any vegan food options and the volunteer with the key to the showers decided to leave early. Apparently since no one came between 6:00 and 7:00pm, he assumed everyone who wanted a shower had already gotten one and closed two hours early. ARGH!!! We found a place in town for some dinner and all took turns in a hotel shower before most of us went back to the park at the finish line to set up our tents. After the hours of running and the lack of sleep the night before, it didn’t take long to fall deep asleep. So tired were we that we didn’t notice in the middle of the night when they took away the Pot-a-Potties beside the camping area, but when we got up a little before 8, they were gone. Overall this was a beautiful race. It would be extremely difficult not to have stunning scenery in this part of the world. The route was laid out well and the legs were all reasonable distances. Going into it there were so many signs it was a well organized race. They had emailed us with up dates and all those who had run it before said their wake-up system worked perfectly. Unfortunately, that wasn’t our experience. I’d love to run there again, but I think I’ll wait a few years for the kinks to get worked out of this young event before signing up for the Wild Rogue again. But remembering what I said after Ragnar, I might surprise myself and register for next year, after all, the running was great. Don’t we look amazing? You’d never know we just finished 224 miles. 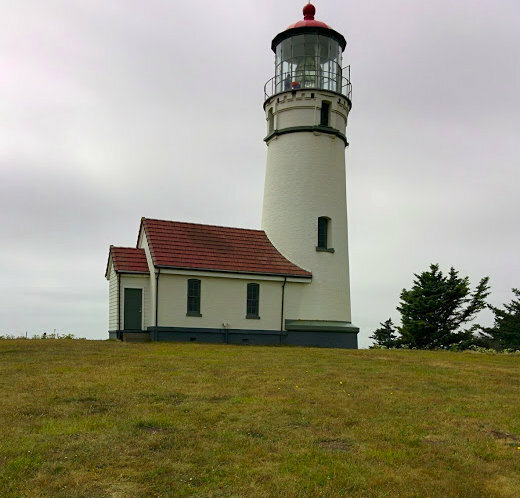 This entry was posted in Running, Travel and tagged Oregon Coast, Races, relay. Bookmark the permalink. Great write-up and super pics Woody! Have you done any relays? All your runs that I remember were solo events. Every runner should try at least one relay just for the experience. No relays yet. The only time a group of my friends formed a relay was just before I became a runner. But who knows? Maybe people are waiting for me to suggest it? Totally agree with your criticisms and feedback of the relay, both good and bad. Hopefully things will improve next year…..especially since I already signed up for this race again!